Stopped by today and realized that it has been a year since my last post! I think it is because I am on FB a lot. I was not a great fan of FB but I got more involved as I started posting for the Auxiliary. I am one of the administrators on several FB pages with duties to post and monitor comments, etc. That takes about an hour each day, and now, I am about to take on another Auxiliary FB page for the Auxiliary at national level. It is a pretty big job and I am honored that they asked me. At any rate, it is the time demands by these other social media venues that keep me away from here. That, and I have been gone so long that I feel disconnected. I have not been painting much but this year, I took a stab at miniatures. 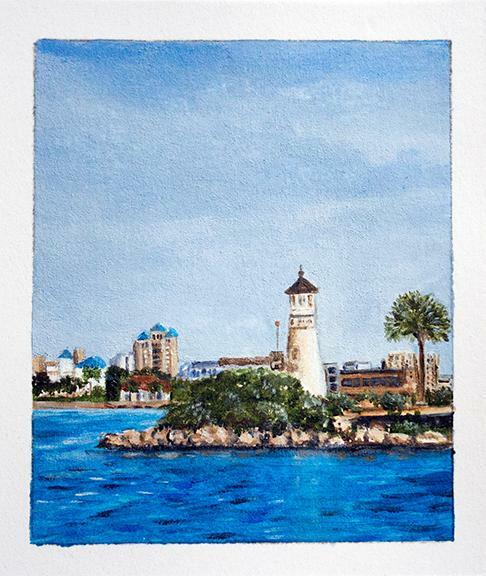 The lighthouse above is a watercolor just under four inches high. I don't have the right type of material to paint miniatures. The best surface is something called 'ivorene' but I refuse to spend the money to buy it as it is expensive. Instead, I apply gesso to watercolor paper and burnish it until it is smooth. For now, that works well enough. I am getting closer to my sister even as the gulf between me and my son widens. His wife attacks me mercilessly which I do not understand. I've never done anything offensive to her. She acknowledges that but says it is because of how I treat my son. In April I flew to Nebraska to visit my sister. I had to pay for my dog and my luggage, but because of my accumulated frequent flyer miles, the entire trip cost me less than $300. I wish I could see my grandsons, but when my son and his family came to Florida last year, they went to Disney World, only about an hour from me, but I was not allowed to see them. They were "too busy." So God is my witness, while I was not a perfect mother, I did NOT abuse my sons either! I do not deserve this treatment from them. I am getting my house in shape again- at least what I can afford to do. I desperately need a new roof but I cannot afford one. In the mean time, I am getting some of the landscaping replaced and the exterior painted... but I really need a new roof! Here is another mini. 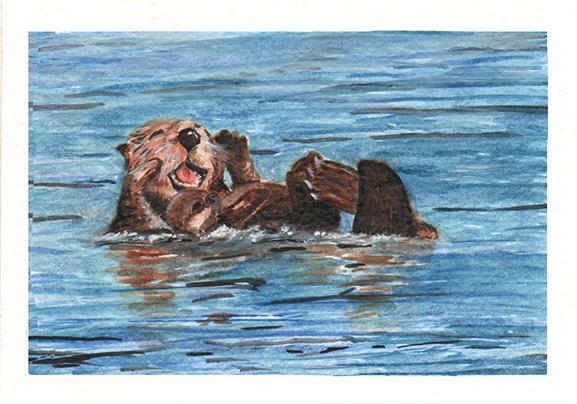 A sea otter! It's so nice to see your beautiful paintings again, Dottie. I'm in the same thing you are with regard to Facebook, I'm administering two groups related to the flood recovery in my area, and spend 1 - 2 hours every day finding interesting things to post on them in order to keep people coming back. It's gratifying to go to some event and have people come tell me how much they appreciate the information. That online community is going to be vital during the next disaster, probably a wildfire, in our area, but in the meantime we have to keep everyone engaged so they remember to share information on those FB groups when something happens. Hi Dottie. Nice to catch up on your "doings". Love your minitures. a dysfunctional family is hard to bare, know the feeling well , never spoke to eldest daughter for 3years until she apologised. I am starting to accept that my son will never love or have a good relationship with me. That was one of the hardest things I ever came to terms with. So sad to hear about your son's alienation. I don't see the attraction of Facebook, except I use it to locate people of prominence in the political area and post my objections to their lies. I don't use it for anything personal. So I hope you will come back to MyBloggers more often. This is the place where people care. I started to use FB for the Auxiliary and well, that is how it started. I reconnected with friends from Our Lady of the Highlands (HS). I remember once either here or on Blogster when someone remarked that some of my experiences and relationships were questionable and I must be fabricating some of it. I don't remember who it was- but when I reconnected on FB with the people from my past, I always thought of that person. "See, these experiences are real and here are the people who shared them with me." Good paintings! I love to see your progress! We come to MyBloggers every day. We are good members, Hobbes and I. I remember watching the sea otters along the rocks on Seventeen Mile Drive in Monterey CA when I lived out there. It was a hoot, especially when they were breaking open shells on their bellies with rocks. I hope to come back more often. FB has changed MyBloggersville. Anything more than a few sentences is just too much to ask for these days. FB has changed all blogs except for those that produce income, like Wordpress.